Magnolia Cemetery was established in 1860 and was operated by a private cemetery corporation until the City of Norfolk purchased it in 1911. The cemetery lies in the Berkley section of Norfolk, one of the oldest communities in Virginia. Its history began when the Herbert family of Lower Norfolk County received land grants at the junction of the Eastern and Southern branches of the Elizabeth River in 1644 and 1666. Berkley underwent several name changes from 1728 to 1890 including Powder Point, Ferry Point and Washington Point. It did not become a progressive community, however, until after the Civil War when Lycurgus Berkley, a wealthy Norfolk dry goods dealer, began to develop it as an organized town. Berkley was incorporated as an independent town in 1890 and John Berkley, a son of Lycurgus, was elected its first mayor. Lumber mills, box factories, knitting mills, shipyards and a nationally-known winery have all called Berkley home through the years and the fortunes of many now-prominent Norfolk families were made in these facilities. However, Berkley's period of prosperity ended by World War I and residents began moving to Ghent, Larchmont, Lochaven, and Meadowbrook. Their exodus was quickly followed by a period of rapid deterioration from which Berkley is still recovering. Berkley is listed as a National Historic District and is home to Norfolk's Ship Repair and Maintenance industry. Search for an interment in Magnolia. 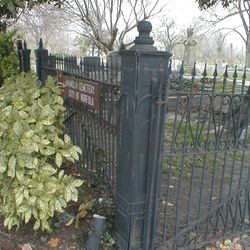 Access a listing of Magnolia interments. Learn about Norfolk Notables at Magnolia. Magnolia Cemetery is in need of conservation. Time has taken its toll on its monuments and decorative ironwork, particularly the ornate iron gate that was removed several years ago and remains in storage awaiting restoration. Currently, conservation volunteers are conducting a comprehensive cultural resource management survey of Magnolia Cemetery. The results of the survey will help NSCC and the Bureau of Cemeteries prioritize repair and restoration needs at Magnolia. If you would like to volunteer to assist with the conservation of Magnolia Cemetery, please sign up here.